The Devonian Low Thermal Maturity shale gas play, also know as the Northwestern Ohio shale, is located within the Appalachian Basin in Kentucky, New York, Ohio, Pennsylvania, Tennessee and West Virginia. The location of the Greater Siltstone is also within the Appalachian Basin in New York, Ohio, Pennsylvania, Virginia and West Virginia. The USGS estimated a total area for the Low Thermal Maturity as 45,844 square miles (29,340,000 acres). The Devonian Low Thermal Maturity has an average EUR of 0.3 BCF per well and approximately 13.5 TCF of technically recoverable gas. The average properties of the Low Thermal Maturity shale include depth (3,000 ft.), thickness (371 ft.), porosity (7%), and the total organic content is unknown. 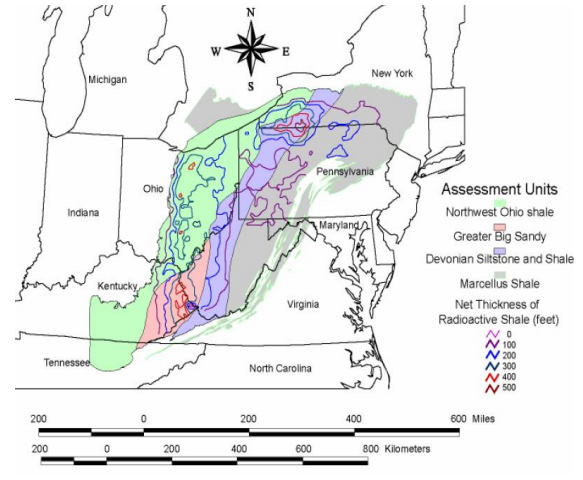 In 2002, the USGS conducted an assessment of the Low Thermal Maturity and Greater Siltstone in the Appalachian Basin. They estimated that the total undiscovered resource for the Low Thermal Maturity is between 1,454 and 4,339 BCF, with a mean of 2,654 BCF. The total undiscovered resource for the Greater Siltstone was estimated between 892 BCF and 1,894 BCF, with a mean of 1,294 BCF.